Angie Bruyere sits on the cover of Blood Like Wine with a s flowing white gown, a benevolent ruler of the front porch, the grand dame of Country living. That woman is different from the Angie and the Deserters frontwoman that spits and snarls with a smoky seduction on “Country Radio” as the tune watches with longing as a lust driven love affair between artist and fan plays out. Blood Like Wine offers “The Gift” over a rumbling Americana groove that moves Angie through a memory laden dream as the album gently wraps hurt in lightly touched notes and beats on “Don’t Cry” and spreads a “Smile” out on a western landscape of gliding pedal steel and fiddle sways. Angie Bruyere grew up in the North Country of upstate New York before relocating to Southern California. Angie and the Deserters offer the Blood Like Wine E.P. as a follow-up to their successful debut, West of the Night (2015). Recorded in Nashville, Tennessee, Angie and the Deserters draw lines and stake a claim for dignity with “Ain't Goin' Down” as “On My Way” rolls on a dark highway seeking new beginnings. 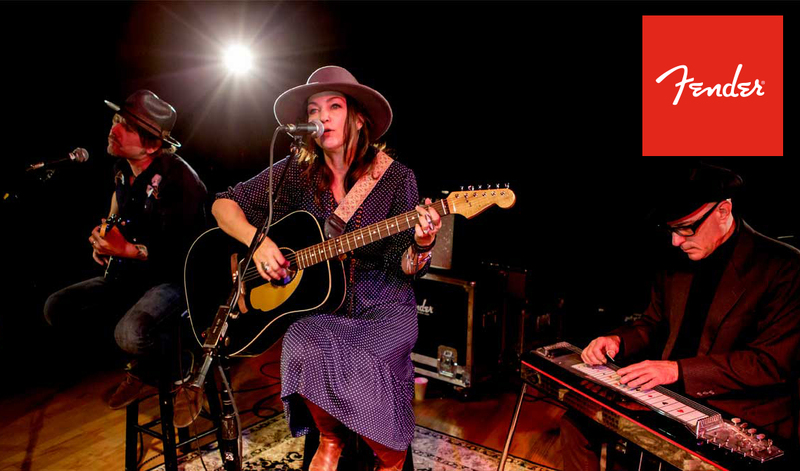 Angie and the Deserters hit the scene with their 2014 release West of the Night and their latest release, the single “Country Radio”, harbingers the imminent appearance of their second effort Blood Like Wine. The first song off the forthcoming EP plays and feels like a shot across the bow of an entire musical community. The band enlisted uber-respected country producer Jeff Hutchins to helm the recording and he assisted them in creating a lean, meat and potatoes affair that puts Angie Bruyere’s once in a generation voice over without ever short changing her spectacularly talented band. “Country Radio” bristles with enough attitudes for five songs. Bruyere cites the “outlaw country” movement of the 1970’s as being an important influence on her and you can certainly hear it in this song. This is unapologetic, hard-bitten music played with impeccable chops, especially on guitar, joined with a show stopping vocal and vivid lyrical narrative that plays on the familiar while exciting us with flashes of the new. Everything is sharpened to a fine point, as well, thanks to the muscular economy her songwriting imposes over the performance. “Country Radio” barely clears three minutes in total running time and remains exhilarating throughout. The guitars explode in a number of rave ups through the song and provide much of the musical firepower. Each succeeding blast varies slightly from the one preceding it and, as a result, the players do a superb job of offering listeners different textures within a traditionally narrow context. Bruyere’s voice is exemplary and one of its chief strengths is her instinct for singing with, instead of against, the hard-hitting music blasting around her. There’s a percussive bite to her voice that helps lightly accentuate the stripped down drumming and her way of turning a number of phrases in the song will stick in the memory. She brings technique and passion together in a potent mix, but it’s the bracing soulfulness and commitment of her vocals that people will ultimately remember. The lyrical content has strong verses and a to the point chorus. Rather than just a series of random impressions, Bruyere’s lyrics show her surprising depths as a songwriter and benefit from a strong narrative. There’s coherence on every level of this song that one doesn’t often hear from modern practitioners of the genre. Most are too busy serving up reverential tributes to their influences rather than busying themselves with marking out their own musical and lyrical territory. “Country Radio” places Bruyere exactly where she wants to be, a renegade musical force living life on the margins, and filling every line with passion. An action packed opening single like this can only mean great things from the upcoming EP release. Bruyere is throwing down the gauntlet here and announcing herself as a vital, formidable force to be reckoned with from hereafter. “Country Radio” is a rootsy, unimpeachably honest reminder of what personal and physical music can do for listeners. Angie and the Deserters will turn many heads and win countless fans with this new release. Angie Bruyere and the Deserters showcased their heartfelt, alt-country vibe. Bruyere, a former model who has been writing poetry and lyrics as long as she can remember, strummed a Tom Petty Kingman Acoustic from the Fender Custom Shop while members of her band rounded out the sound with a Fender American Standard HH and a steel-pedal guitar. For the performance, Bruyere and the Deserters opted to play “Mason Jar” and “Goodbyes,” two tracks that come off 2014’s West of the Night. In both songs, Bruyere’s sultry voice stood out, as she possesses a distinctive purr that is both sweet and dangerous at the same time. One of the criticisms of country music is that a lot of it sounds pretty similar. Mind you, it's a valid point. There are a lot of country artists that are hard to distinguish from others. That being said, not every country artist falls into that cookie-cutter category. You have to give credit to those bands that go their own way without caring what sort of sound would sell millions of albums. The Deserters is a band fronted - like so many country bands - by a female vocalist. The refreshing thing about Angie Bruyere is that she has a a little roughness in her vocals. It's refreshing because so many artists have gotten to the point that their vocals are so polished they don't even seem real. Like Lucinda Williams, Bruyere sings with a little rasp in her voice. Not only that, but she's not afraid to curse in her songs. In "Ain't Goin' Down" - the first song listed on the band's ReverbNation page, you'll hear Bruyere use the phrase "stupid f---in' bull---t". Not that cursing in a song is revolutionary, but it's just one thing that sets this band apart from other country bands. You'll certainly never hear anything like that in a song on country radio. Beyond that, Bruyere just has one of those enchanting voices that you can't help but love. At moments, she sounds a bit like Lucinda Williams, Sheryl Crow, and even Carla Bruni. She also has moments where her lilting voice is reminiscent of Dolly Parton. The thing is, however, that no matter who she reminds you of, you can't deny that her voice is delightful. This band mixes a fair amount of rock and roll into its sound. For a good example of this check out the song "Seventeen Days". The melody in this song is reminiscent of Tom Petty. there is an element of country in it - especially in the honky-tonk piano - but more than that it's just a good rock and roll song. In fact, that's a pretty good summary of this band. This is a band that straddles the line between country and rock and roll. If you think this band is something special, you're not alone. Recently Angie Bruyere was featured in an interview on Fender.com. In the interview, Bruyere shows that she's much more than just a pretty face (she is a former model) and a pretty voice. In the interview, she discusses the band's new album West of the Night, which is available now.